Looking through a box of old documents, I recently found the instruction booklet that came with the copy of Super Mario Bros. 2 I received when I was a kid. For whatever reason, I’ve held onto it ever since. I flipped through the booklet and reveled in the nostalgia until I happened across something that, as a kid, I had noted as strange. 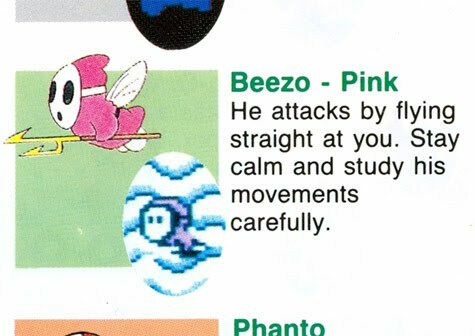 If you were as obsessed with Super Mario Bros. 2 as I was, you might realize that the background behind the pink Beezo character doesn’t fit. Those wavy lines mean that the Beezo is flying in front of the “ice world” version of the green hills that you see throughout the game. However, there’s only one ice world and only one stage in it that has those white hills: Stage 4-3. (The younger version of me knew the stages by heart. I fired up the Virtual Console version to check and make sure that this was the case.) You encounter the hills right at the start of the stage, but there are no Beezos there. The only one that shows up in the stage appears much later, right before you fight Fry Guy.And since I’m on the subject, were there any pink Beezos in the game at all? I can remember red ones, green ones and gray ones, and that’s it. I guess this little mystery could be easily solved by assuming that the above screenshot was taken from a beta version of Super Mario Bros. 2, but that itself strikes me as strange to consider, since the game already had a prototype-like-ancestor in Doki Doki Panic. But a proto-Super Mario Bros. 2 does exist, and this article spills the goods about it. This probably is the source of the image, I’d bed, and it’s not even all that weird, since I also had one of the Super Mario Bros. 3 boxes with the alternate map layout for Grass Land. One more thought about the instruction booklet: For the snake-like Cobrat enemy, it notes that it “moves on Wart’s command, often appearing in the dreams of Toad.” As I kid, I wondered what this meant, but is it a hint to gamers that Toad is the most effective character to use the desert levels? Who are those fairies you free from the jar end the end of the game, anyway?